Marian A. Hoffman, 75, of hampton, NJ went home to be with the Lord on Monday, November 19, 2012 at home. Born: She was born August 7, 1937 in Easton, PA. Personal: She had lived in Hampton for eight years, moving from High Bridge, NJ. She was the daughter of the late Clarence and Alice Ihrie Wyant. 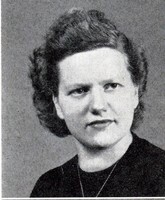 Her husband, Charles A. Hoffman Sr., passed away in 2003. She was a housewife and loved spending time with her family. Memberships: She was a member of the Faith Chapel wesleyan Church and a past member of the High Bridge United Methodist Church. She loved her cats and was an avid bingo player. Survivors: Include one daughter, Patricia Ann Hoffman of Hampton, NJ; three sons, John Fitzgerald Hoffman and wife, Sherri of Lebanon Twp., NJ, Russell Irving Hoffman of Hampton and Robert E. hoffman and his wife, Darlene of Hampton, NJ; five grandchildren; nine great-grandchildren; one brother, Howard Charles Wyant of Easton, PA; two sisters. Georgia Holtz of Easton, PA and shirley Wyant of easton, PA; several nices; and nephews; great-neices; and great-nephews. Prededeased by one son, Charles A. Hoffman Jr. who passed away in 2004; and several brothers and sisters. Services: Calling hours will be friday, November 23, 2012 from 2 to 4 p.m. and 7 to 9 p.m. at the Naughright-Scarponi Funeral Home, 66 Main Street, High Bridge, NJ. Funeralservices will be Saturday November 24, 2012 at 11 a.m. at Faith Chapel Wesleyan Church, 43 Lower Landsdown Road, Annandale, NJ. In Clinton, NJ.